Schmid was one of the three general secretaries, along with Héctor Daer and Carlos Acuña, that formed a triumvirate that headed the union grouping. 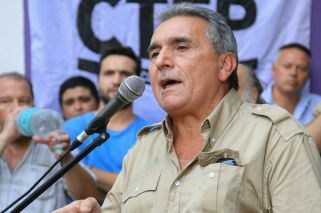 The secretary general of the Argentine Confederation of Transport Workers (CATT), Juan Carlos Schmid, on Sunday resigned from the leadership of the General Confederation of Labour (CGT) umbrella union. Schmid was one of the three general secretaries, along with Héctor Daer and Carlos Acuña, that formed a triumvirate that headed the union grouping. There had been reports that Schmid that disagreed with his peers on key decisions, but the news came as something of a surprise nonetheless. Local reports suggested he had waited until after the Tuesday, September 25, general strike before resigning. Confirming the news on Sunday, Daer told the Noticias Argentinas news agency that his colleague has resigned, noting that it was now "public knowledge," though when pressed he said "the reasons [for the withdrawal] must be communicated by him." The secretary general of the Camioneros/Teamsters union, veteran union leader Hugo Moyano, said today that Schmid's resignation was a result of discomfort. "He was not comfortable, because it is not a very comfortable situation to be in the CGT," Moyano said, "[being] unable to fully exercise the decisions they are demanding from below. "He felt uncomfortable being there [in that position] and that is why he has resigned," said Moyano. Schmid, seen as a 'Moyanist', was reportedly uncomfortable with the umbrella group's direction, feeling it had been too lenient in some of its positions against the Mauricio Macri administration. n related news, a train strike scheduled for Tuesday was today cancelled.